Minimum order is 1 coolies. Pricing as low as $8.99 each. 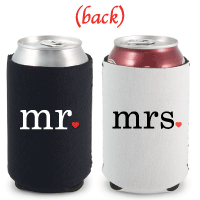 A perfect gift for the bride and groom! Our high quality neoprene can coolie it imprinted with 2 ink colors with matching text. Neoprene can coolies are designed to snugly fit around a can but also fits most bottles. Your order ships from our warehouse within 5 business days. Rush available. All pricing is per set. If you order 1 set you will receive 1 of each coolie. 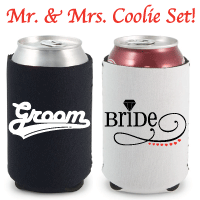 If you order 2 sets you will receive 2 of each coolie. Price includes standard shipping. Standard shipping is USPS shipping from NJ. Item can take up to 5 business days to arrive from when order is shipped. Your set will ship within 5 business days.